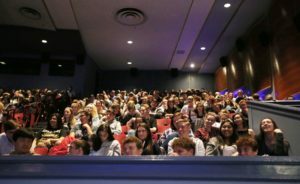 Nearly 700 high school seniors from 14 schools in the Klamath Basin got an earful of advice as they face the challenges of life and their pending graduation during the third annual Graduation Motivation event in the Ross Ragland Theater Thursday. Organized by the Herald and News and Klamath Promise and sponsored by a long list of local businesses, the students heard A’ric Jackson, keynote motivational speaker, deliver real life, heart-breaking and inspiring stories at the two-hour event. “He opened my eyes to live your life. Gave me a new perspective on things,” said Juliana Jaime, also of Tulelake. “He was awesome, good life lessons,” said Jaden Price of Henley High School. 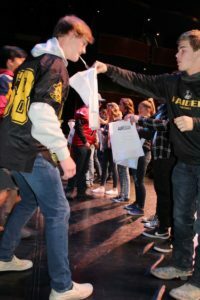 “Funny, but emphasized that you must make the right decisions,” said Mason Geigle of Mazama High School. Using those three key points, he encouraged the students to be themselves and pursue their goals, no matter what their peers may say or how they may judge you. Jackson encouraged the seniors, who he always addresses as “ladies and gentlemen,” to discard the pre-conceived notions of people and to be willing to let go of grudges that they may be holding onto. He recalled in his own life how he held a 13-year grudge against his father, who had left him when he was 9, and got into an argument with him at a critical time in his life. “I was a finalist for the TV comedy show, ‘In living Color,’ ” he said, which was the launching pad for stars such as Jamie Foxx, Jennifer Lopez and Jim Carrey. He said he bombed at the audition because he was angry at his father and could not focus. “Don’t let that happen to you. Don’t pass up opportunities because you think it’s better to impress your friends. Impress yourself,” he said. Graduation Motivation is held each year as a signatory event, kicking off the school year to encourage seniors to work hard to earn their graduation degree. It bookends with the Graduation Sensation at the end of May, where all graduating seniors parade down Main Street and are eligible for some $30,000 in scholarships donated by the community. The event was live-streamed on the Herald and News Facebook site, www.facebook.com/handn, and can be viewed there. The event is sponsored by Klamath Promise, Herald and News, Pacific Power, Klamath Community College, Oregon Institute of Technology, Kingsley Field Air National Guard, Cascade Health Alliance, Papa Murphy’s, Subway Sandwiches and Dutch Bros Coffee.